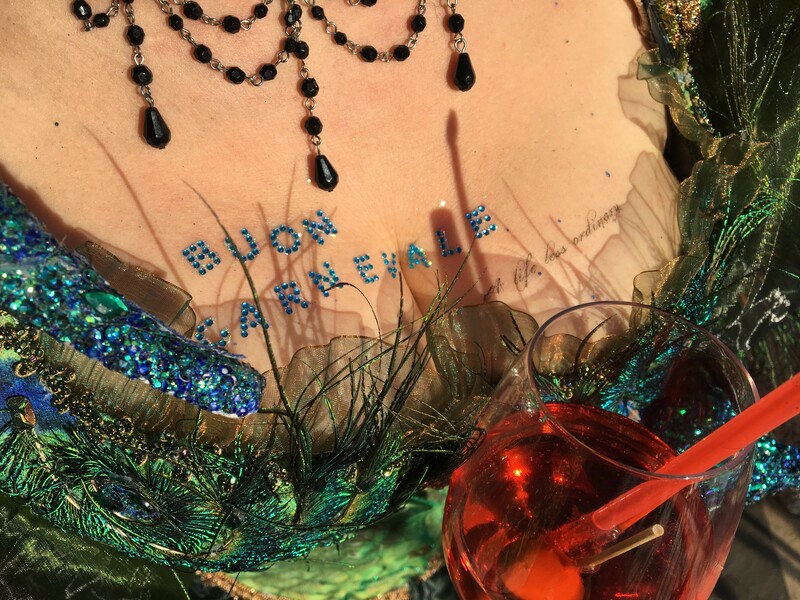 my 17th carnevale is over and here is a brief (haha….) review and some films and pictures of it. Enjoy! I was in Venice from January 26th to Febuary 10th, accompanied for some days by my children, husband and some friends. The second week I was free to do photoshootings, banquets, parades and other events. 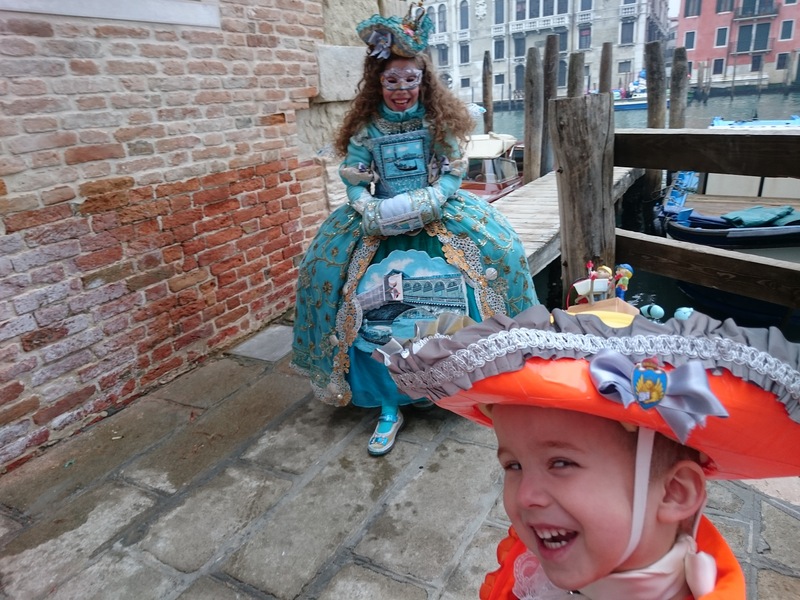 For my little son it was his first carnevale and he had lots of fun with his sister and parents, as well as meeting with photographers and even a TV crew from German TV ZDF. The little “Bob the builder in the 18th century” was our king and had the choice to decide at any point when we would stop walking in costume. But he was really brave and had three long strolls through the city with us, waving at people, charming them in his cute outfit. Same as his lovely sister as the “Lagoon of Venice” (which by her request resembled the dress of Elsa – but sorry, I don’t do Disney, so we agreed on a stunningly beautiful dress in the same colour. It was her idea to add some shells (now silver plated) from mussels that we bought on Rialto market last summer. I am happy that my kids are already “helping” me to design an work on the costumes and have so much joy wearing them. 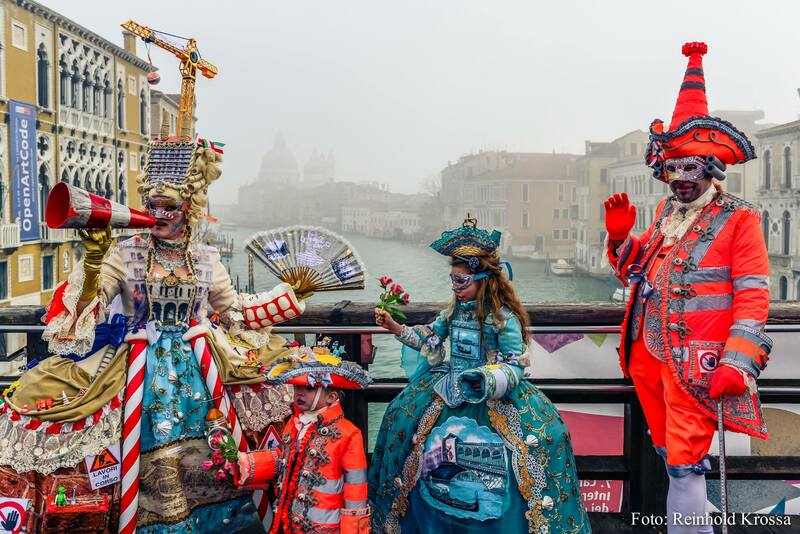 The theme of our this years main costume was – in honour of the carnivals theme “Arts, craftsmenship and traditions of Venice” “Venezia – the most beautiful construction site of the world”. I did a lot of research on old Venetian architecture like Palladio and famous buildings and talked about construction sites like the “Fondaco dei Tedeschi” the old trading house of the Germans that Benetton is currently remodeling (it was on my upper part of the dress, fenced in, with little Lego and Playmobil figurines as the craftsmen who do the construction in Venice). My wig was Palazzo Papadopoli, now one of Venice’s top hotels and right next to the place where I stay for ten years now. It had a 80cm crane built in which made a lot of people laugh. In general the reception of the people in the streets was phenomenal. Everybody got the little ironic idea in a second and could totally relate to the topic, since Venice is covered by construction sites which gave tons of photo opportunities. Unfortunately or ironically we had a night construction site in front of our house which kept me awake from 2 – 6 a.m… Maybe I should not have “asked” for it. 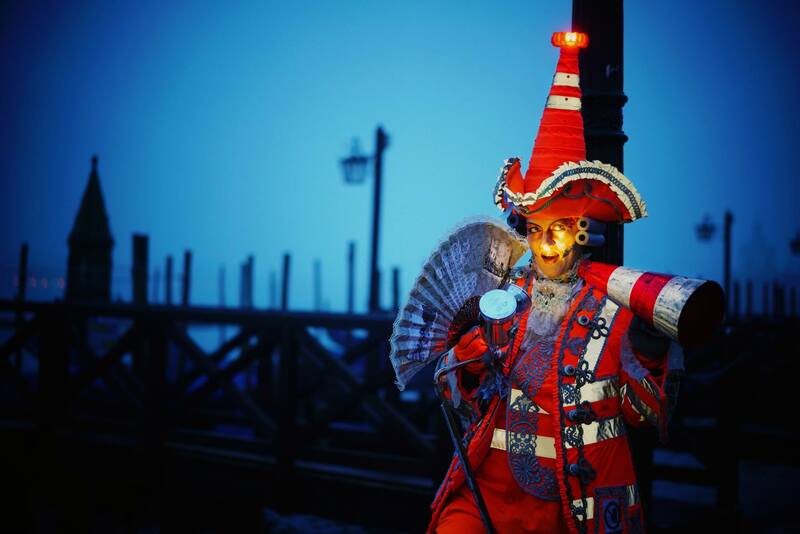 One Italian said in the TV film we made, that he especially loved our costume, cause it told the truth how it really is in Venice and that it was so close to reality. Unfortunately the jury did not agree in the finale of the competition. We were under the last five contestants and some friends of mine from Senigallia won with their beautiful creation about “bathing people in Senigallia” and two men in red velvet frocks from Sicily dressed as “Coaches from Sicily” got the price for best costume in the theme of the carnival. Well, one cannot win every year. But I was very happy that the audience appreciated my detailed and dedicated to Venice work. 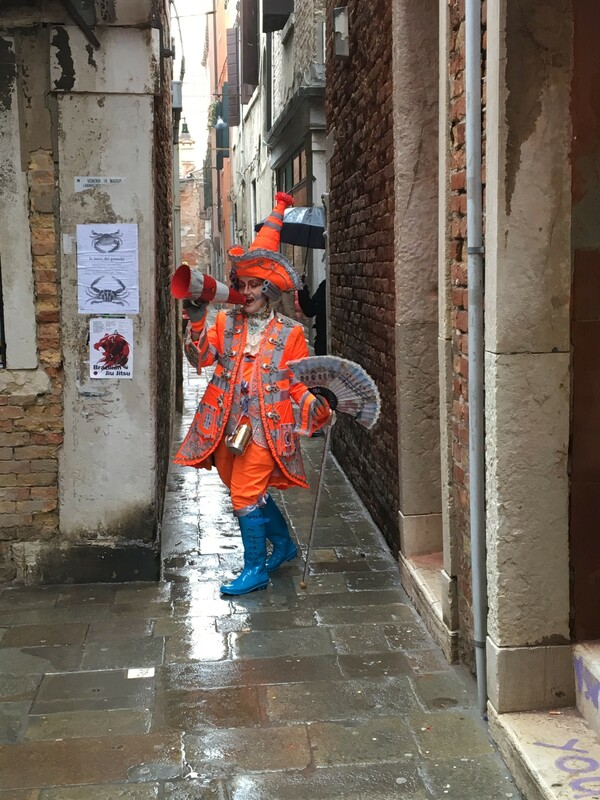 I also have to give a huge THANK YOU to my friend Adam, a carpenter who lives in Venice (and does food tours there – don’t miss “Venice Bites”) and who helped me to protect my dress from the constant rain on competition day. Since it fitted the look of my costume, I decided to dare to go out (I never did it before and never will again ruin a dress in the rain, that was a first and last in 17 years) and built a long Venetian umbrella with plasticfoil-tent that Adam – strong as a tree as he is – wearing his craftsmen gear and 20kg-tool-belt !!!! – carried all the way through the contest. But it did not help, the dress was soaked and many parts have to be replaced now. But we got a lot of funny photos of us standing in the rain. As I said: once in a lifetime. After this experience I also decided to not participate in the competition anymore. I won four times, that is enough for a lifetime. My little son and daughter enjoyed staying up there on the catwalk and when they were with us, we won the daily award on the first Saturday which was very exciting for them and fortunately not as long, wet and strenuous as the finale. Maybe in a few years they might decide to want to compete. But that they will have to decide later when they are bigger. I am very sure they will ponder it “The view from stage is so nice” as my daughter pointed out. But at any point of time it was their choice and will be in the future to go up or stay down. But don’t be afraid that I will stop doing more stunning costumes. I cannot live without that and will still continue doing carnevale but definitely without the show. There are so many more things to celebrate. 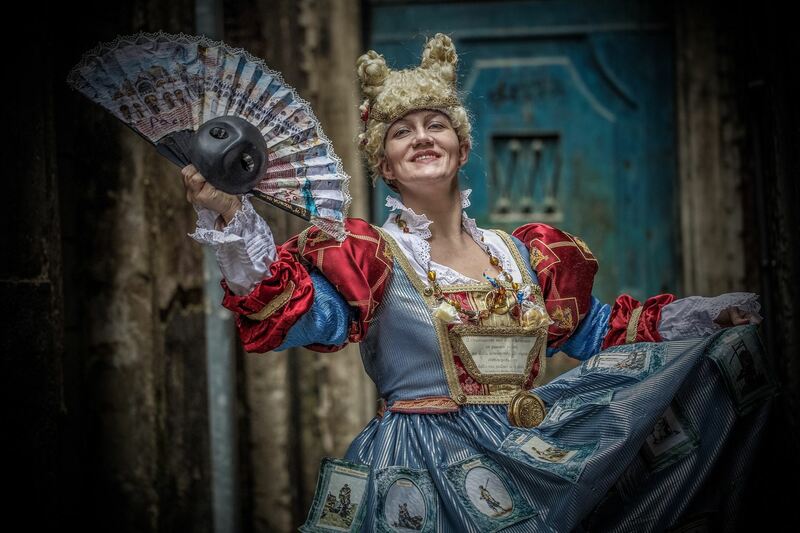 Like the by my friends the “Assoziazione dei Maschereri” revoked “Hunt of the Bull” a traditional mask parade that goes back to the 11th century (see “History of the Carnevale”) where I had the honour to walk behind the 12 beautiful Maries of the quasi “pageant” of the carnevale. I had the chance to talk to some of the girls while we walked through the whole city. Great to see this traditional event take place again. 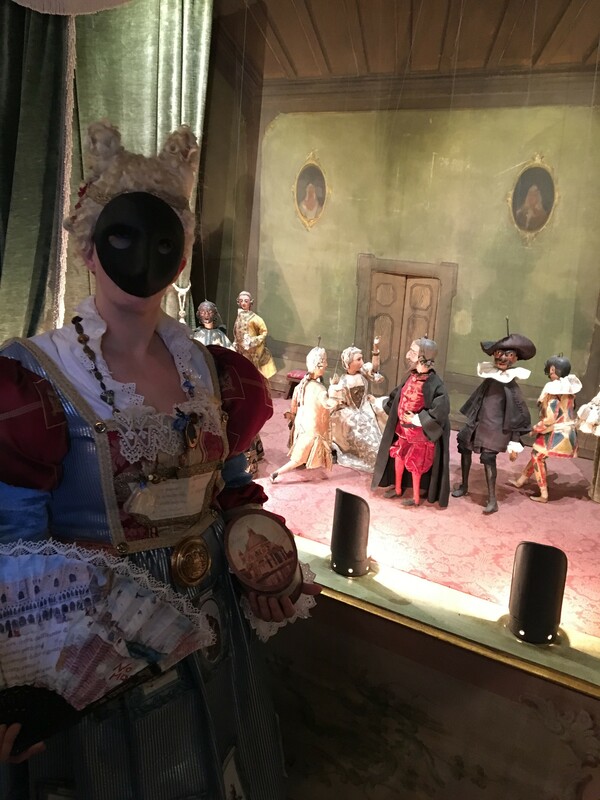 Also the Maschereri invited me to an event in the Goldoni house in honour of the famous writer of the Commedia dell’Arte. To this I wore a special historical dress of a “Venetian Lady in the 15th century” I made. 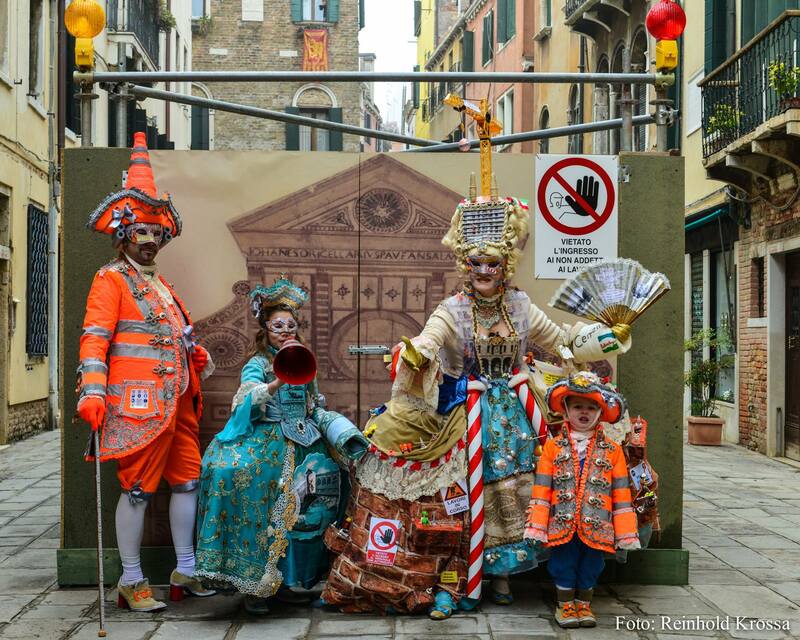 I did research in the famous book of Grevembroch (original lies in Museo Correr at Piazza S. Marco) about the traditional way of dressing of the Venetians. It was a pretty, petite dress with a little typical Venetian wig. For the dress I used fabric from Rubelli (one of the oldest and most expensive fabric makers in Venice), real Murano glass from my friend’s Ferro Lorenzo shop (highly recommended if you are interested in real Venetian craftsmenship and artisan production), on the neckless I wore “Fritelle” and “Castagnole” and “Galani” cookies/cakes like they were diamonds from my favourite bakery “Rizzardini”. I also had real Venetian lace and about 40 drawings of various arts and crafts of Venice from the famous book mounted on the dress. The whole set was completed by a traditional black Moretta mask from my friend Gualtieros shop “Tragicomica” (Gualtiero is one of the students who started the new carnevale in the late 70s and has a nice traditional mask shop with handcrafted masks), held by a knob in my mouth. 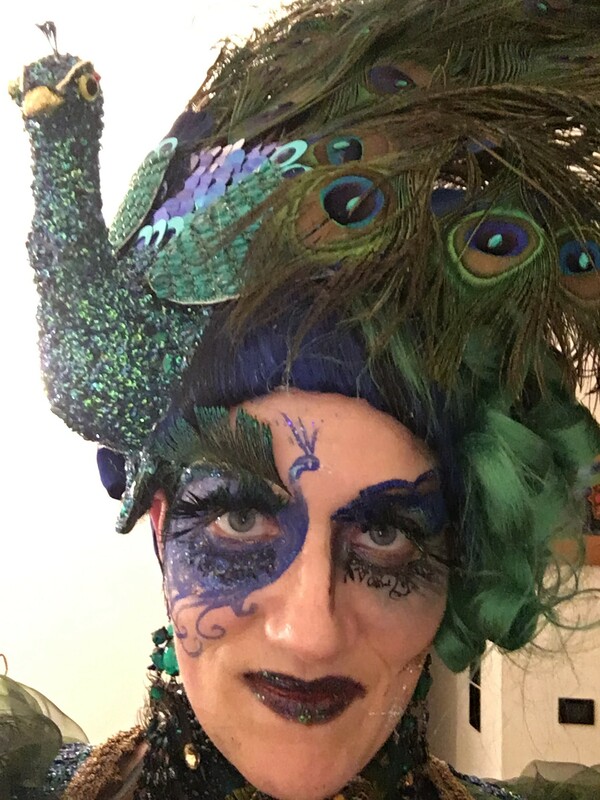 My third dress, a small but very funny victorian peacock with peacock shoes, make up and huge wig was my banquet ensemble. 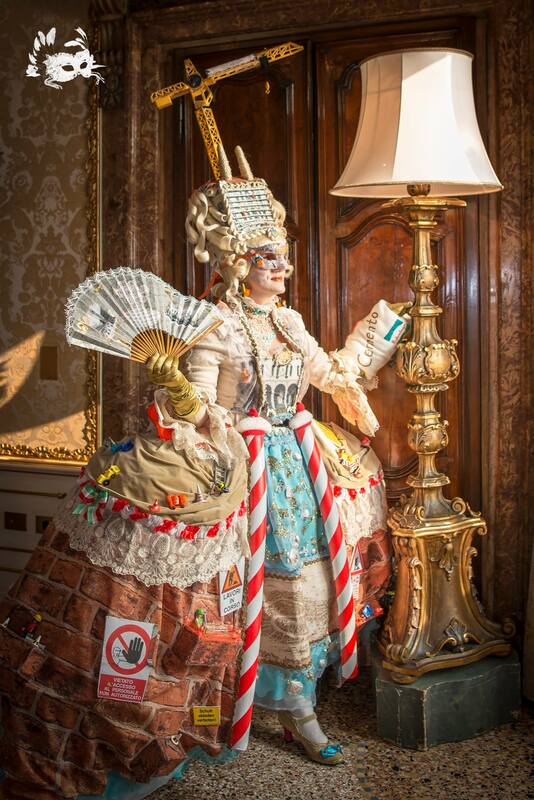 I was honoured to have three fotoshootings with all three dresses in my favourite and most stunning Hotel Danieli. Hard to get in but this year they let me in and I had fantastic photographers like Jason Pavalonis, Robin Yong, Joachim Plump who took stunning photos there and out and about town. The fotos will roll in during the next weeks. So keep checking this website for new pictures. I also had a visit at the Fortuny fabric factory on the Giudecca. I was in paradise!!!! And immediately started dreaming of colaborating with this tradition house of Venetian fabric. I am really very attached to Venice, its history and craftsmenship! They are the real artists!!! I hope they like my creations and maybe give me a hand. Another dream in Venice to fulfill! But definitly a high set one. But to have a long train of Fortuny fabric attached to my next year’s 18th century dress in glamouros red and gold (OOOOOHHHH yes, I DO already have a vision!!!) rolling down the mainstaircase stairs of the Danieli would be an epic foto!!! 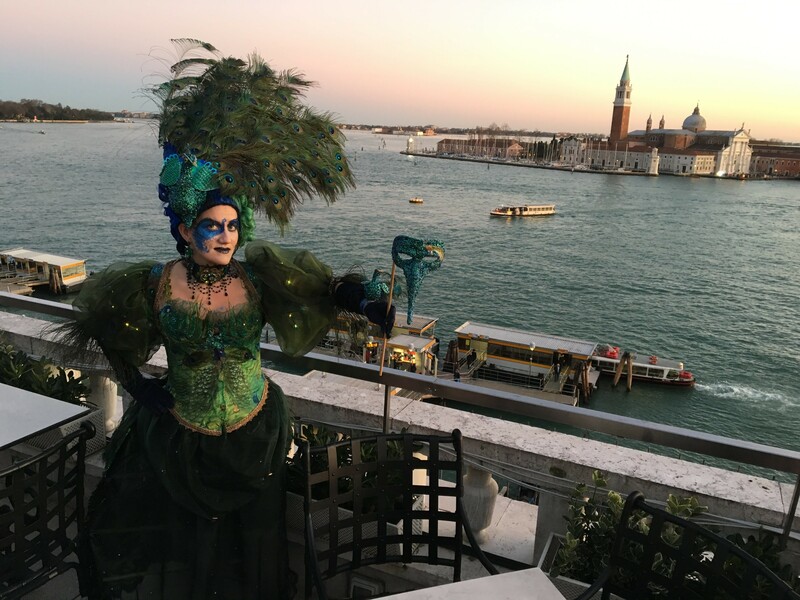 The banquets and parties I attended this year would fill a whole book… so I will skip the stories here and save them for the book I am currently writing about the Venetian Carnival or write them later in the blog. I want to have the book done by the end of summer and get it printed and sent out to the readers by xmas 2016. For this I could need some help doing a Kickstarter campaign, get fotos from this and the last years from all of YOU out there, etc. (please read blog chapter about this). Well, my friends, there would be so much more to write, it was a long, exciting carnevale!!! Now I need to unpack 60 kgs of costumes, get my house in order and cuddle the kids and hubby, detox my brain from this information overload. And after a while I will write some more blog chapters here and chapters for the book! Because: After the carnevale is before the carnevale! If you have any particular questions or comments, please write me!! !